Welcome to the KY TRIO Current Events page. Every story here will display as a news on the main page. If you would like to subscribe to this feed please click on the "Subscribe to posts" button bellow. KY TRIO Scholarship Season is officially open! You can visit the Scholarship Web Page to see the award(s) for which that you may nominate your student(s). These awards are the same as last year, and the deadline is March 27th, 2019 at 5:00 pm EST. Awards will be announced on April 10th, 2019 at the KY TRIO Board Meeting. Please note that you must be a KY TRIO Member to nominate students for KY TRIO Scholarships. The Scholarship Committee is looking for readers to serve on the committee. If you have any questions about KY TRIO Scholarships or would like to volunteer as a reader, don’t hesitate to reach out to Service Member at Large Dr. Michelle Carter. It is time to register for Spring Meeting 2019. This event will be hosted in Richmond, KY on April 9-10, 2019. Visit the Spring Meeting Registration page for more information and be sure to register for $35 and book your room today! KY TRIO is happy to announce that TRIO Day 2019 will occur on February 22-23, 2019 at Morehead State University! Register now on the TRIO Day 2019 page. All types of TRIO participants will have an opportunity to compete in our Student Initiative Competitions, and workshop sessions, including campus tours, will be available for TRIO participants that are not competing that day. Registration is open until February 1, 2019 for regular registration and for Student Initiative Competitions. If you have any questions, Crystal Riddle is the lead contact for the event. 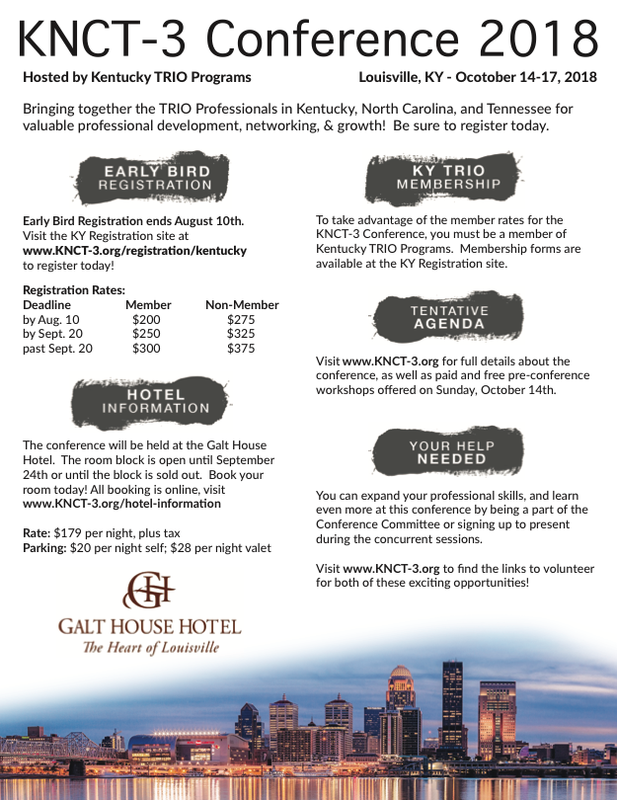 Kentucky TRIO is looking for our next Emerging Leaders! If you're interested in becoming a TRIO leader you should attend the Emerging Leaders Institute (ELI)! If you are interested in being part of the 2018 Emerging Leaders Institute for KY at KNCT-3, you will need to complete a nomination form for this separately. There are a limited number of spots, and not everyone who is nominated will be selected to attend. You must be registered for the 2018 KNCT-3 Conference to attend 2018 KNCT-3 ELI. Registration for the 2018 KNCT-3 is now open! Visit the Kentucky Registration Page for more information about the conference or to register today! KAEOPP Scholarship applicators are now available. Please visit the Awards section of the KAEOPP website for links to the applications and PDF versions of the criteria for each application. The deadline for ALL scholarship applications is March 30th. Berea College will be hosting TRIO Day on February 24th. See the official TRIO Day page for more information or to register your program to attend today! I encourage anyone interested in any sort of TRIO leadership to apply to one or both of these opportunities. These are great ways to start your journey into TRIO leadership. If you have any questions, please let me know, and I would be happy to talk to anyone who wants to participate. Membership is now open for 2017-2018. This process is now completely online with the option to pay by credit card or by mail with a check. Please click here for to register today. Plan to attend the 5th Annual KNCT-3 Conference hosted by North Carolina in Charlotte! It will be November 5-8, 2017 at the Crown Plaza Hotel in Charlotte, NC. Visit the KNCT-3 website for more information, and register at the KY Registration site today!